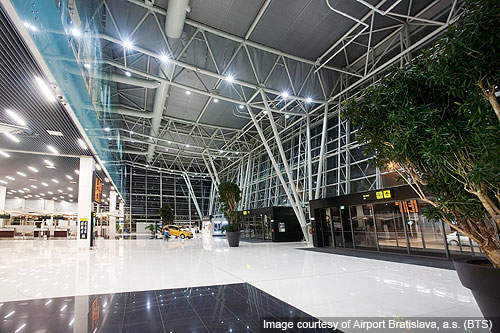 Bratislava Airport is the main international airport of Slovakia. 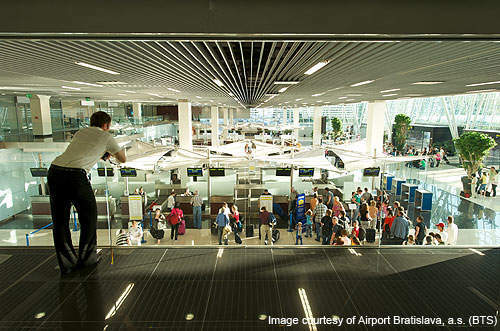 The airport handled 16.6 million passengers in 2010. Construction of the new passenger terminal started on 18 September 2008. The new departure terminal was opened on 9 June 2010. The airport has three terminals A, B and C.
The total terminal area is 18,826m&#178;. The capacity of the new terminal is five million passengers in a year. 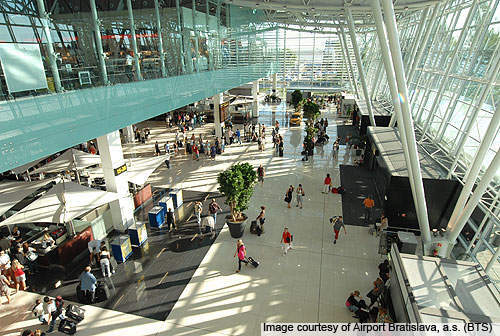 Bratislava Airport, also known as M. R. Štefánik Airport, is the main international airport in Slovakia. It is located 9km north-east of Bratislava Castle. Opened in 1923, the airport is spread over in 477ha. 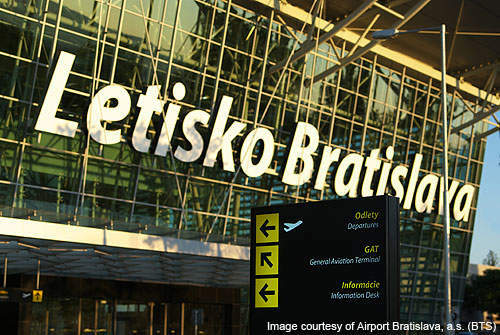 It is operated by Airport Bratislava (BTS). The airport handled 16.6 million passengers and 17,717t of cargo in 2010. It recorded 27,220 aircraft movements during the year. The airport’s departure terminal A is being replaced by a new terminal which is currently under construction. Terminal A was built 40 years ago and was not feasible for expansion to increase the passenger capacity. Phase I of the new terminal was completed and opened in June 2010. The second phase of construction is expected to be completed by March 2012. The airport was built in three stages. The first stage of construction started in October 1948. During this phase two runways (4/22 and 13/31) were built. The second stage of construction was completed between 1951 and 1970. During this phase, the terminals, central boiler plant, main transformer station and new local road networks were constructed. The third stage of construction was completed between 1990 and 1997. 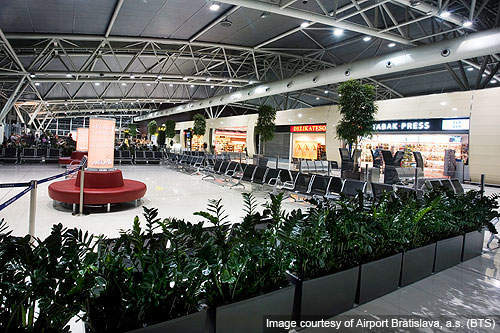 In this phase passenger terminal B was constructed and the lighting landing aids at the 13/31 runway were replaced. An expansion undertaken during 1998-2000 included construction of a new air traffic control tower, modernisation of the baggage transport system, construction of a terminal building, workshops, office administration buildings and central boiler plants. 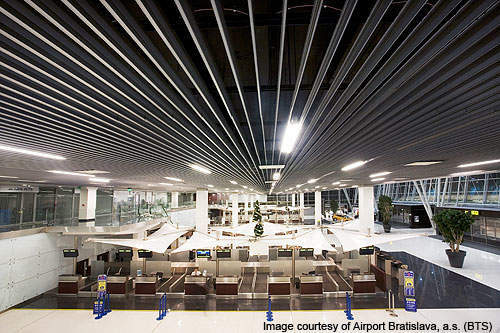 Another expansion during 2000-2004 included addition of new check-in desks and gates at the terminals. More check-in desks were added and a new parking area was constructed in 2005. In 2007 the old cargo building was reconstructed and new departure bridges were constructed. The departure terminal A which was built in 1970 could not handle the increasing passenger traffic. Expanding the 40 year old terminal building was found unfeasible. It was therefore decided to build a new departure terminal to replace the terminal A. The new terminal is being built between the terminal A and the General Aviation Terminal (GAT). Construction was started on 18 September 2008. The project is scheduled to be completed by March 2012 at an estimated cost of €93m. Preconstruction works, carried out under phase zero, were completed between September 2008 and March 2009. The works enabled public transport to be diverted from the approach area to ensure no obstruction during the construction. Phase 1 of construction was started in 2009 and completed by June 2010. Extended boarding bridges were installed and connected to terminal B. Phase 2 of construction started in 2011 and is expected to be completed by March 2012. Terminal A was demolished in January 2011 and is currently being replaced with the new terminal. 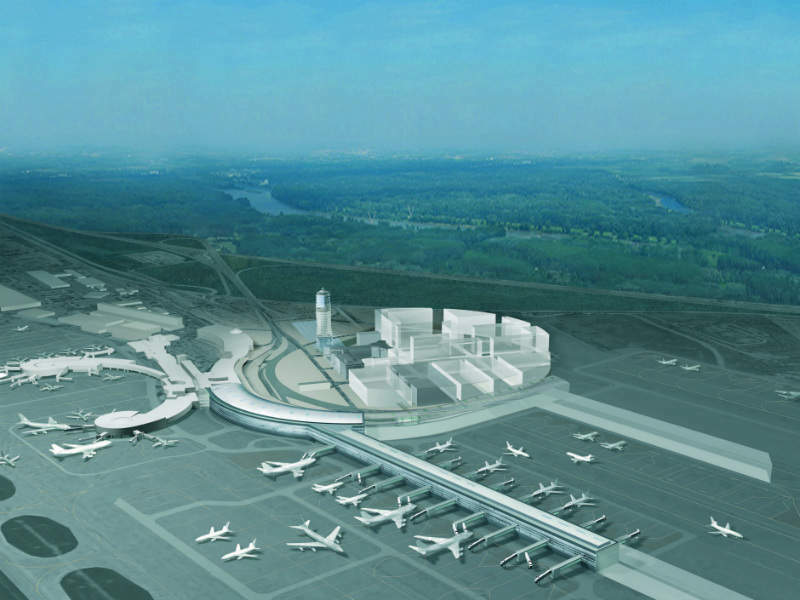 The new terminal is scheduled to be fully operational by March 2012. The second phase of construction will also involve partial reconstruction of terminal B and construction of adjacent roads. The new terminal will increase the passenger handling capacity of the airport to five million passengers in a year. The airport has three terminals. The total terminal area is 18,826m². The ground floor of the new departure terminal has two check-in units each containing 14 check-in desks. The first floor will be used for official purposes. 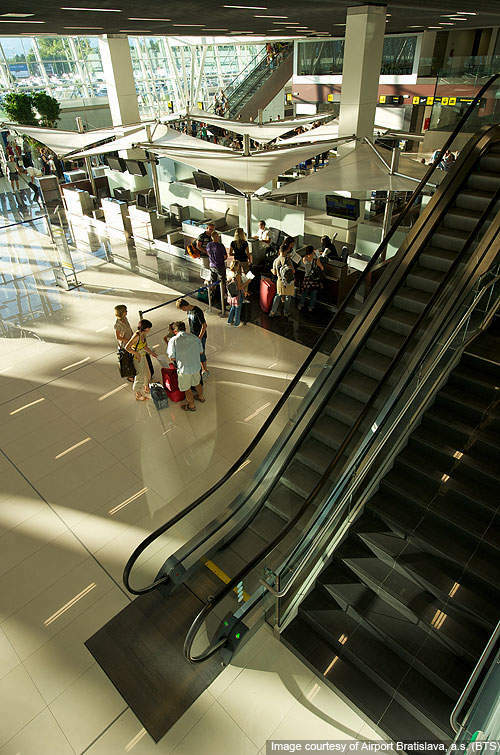 The second floor has shopping, waiting and departure zones, which are equipped with fully automated luggage screening belts and metal detectors. The terminal has nine gates. Terminal B is an arrival terminal built in 1994 for non-Schengen passengers. It has a capacity to handle two million passengers a year. Terminal C is an arrival terminal built in June 2006 for Schengen passengers. The GAT is used for dispatching the general aviation aircrew and passengers. The GAT terminal has a VIP lounge located at the first floor. The airport has two concrete runways designated as 13/31 and 04/22 measuring 10,466ft and 9,515ft long respectively. The first runway (13/31) has International Civil Aviation Organization (ICAO) category IIIA approach and landing standards. The second runway (04/22) is equipped with ICAO category I approach and landing standards. The air traffic control (ATC) tower at the airport has been operational since 1998. It is operated by air traffic services (ATS) personnel. The airport has an aircraft fuel storage facility with six tanks. The total storage capacity is 3,220m³. A fire station is located near the intersection of the runways. The airport also has 125,000m² apron area. Public transportation is available from the city centre to the airport. Numerous taxis, metro rail and bus services are available at the airport. The taxi stands are operated by Breadis and Danube Taxi companies. Founded in 2006, AIRSIDE is an independent consulting company for airport and security planning.